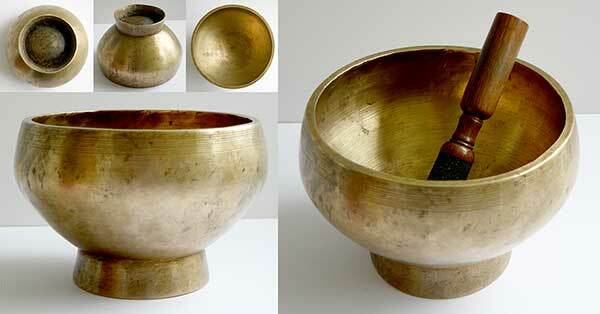 This large, full-bodied, and heavy antique Naga or Pedestal Singing Bowl has a powerful middle E fundamental (328Hz) and is very responsive and easy to play. It is a very substantial bowl with thick walls and a well constructed pedestal. It has a finely grooved lip, multiple decorative bands encircling the outer rim, and a tiny circle at its centre. The structural condition of this bowl is excellent, and it is basically clean but has some light staining here and there. A double-ended teak and suede ringer is included in the price.